Nuance's Nina software uses the technology behind Siri for third-party apps. Siri could be getting a new job soon at your bank. The folks behind some of the technology in Siri, the iPhone's virtual personal assistant, are bringing their voice recognotion technology to customer service applications, including bank, cable and credit card smartphone apps. Nuance Communications (NUAN) last week announced the creation of "Nina," a natural human language input software that is designed to understand customers' questions about their accounts. Think of Nina as Siri's cousin who lives inside your credit card app instead of your iPhone. Nina could be molded to suit any customer-focused application, but in a demonstration with CNNMoney, Nuance chose a banking app to illustrate the technology's capabilities. Just as Siri understands that "Do I need an umbrella today?" is a question about weather, Nina can field contextual questions. For instance, an order to "Pay my bill" brought up Nina's response -- in Siri's familiar voice: "How much would you like to pay?" Nina understood the reply of "my statement balance," and asked whether she should go ahead with the payment right now. "No, let's do it on Monday," got a response of "Okay, I'll set up your payment for this Monday." The software can also check balances, transfer money, and troubleshoot problems, among other tasks. Nuance said the idea is to make Nina smart and fast enough to encourage users to go to the app first, before dialing a human customer service representative. If a customer's issue needs to be handled by a human being, Nina comes with a neat trick: The software can call a rep and provide the company with all the details of what the customer has been trying to accomplish. That means no more sorting through an endless series of call center menus and then having to explain the problem again when you finally get a human being on the other end of the line. Nina also comes with an analytics engine that informs companies about how customers are using their apps. "People will ask their phone different things than they would a representative on the phone," said Robert Gary, general manager of Nuance's mobile care unit. "Knowing what people ask Nina will help them determine what should be automated and what shouldn't." Nina is extensively customizable to work with any app that has customer service features, and it's available on multiple platforms, including Apple's iOS, Google's Android and Microsoft's Windows Phone. Companies can choose their own voice talent if they don't like the stock "Siri" or any of the other computerized voices. Nuance built a nifty security feature in as well: To login to an app that incorporates Nina, users can say their password into their phone, and Nina will run a voice biometrics engine to determine whether it's really the customer trying to get in. 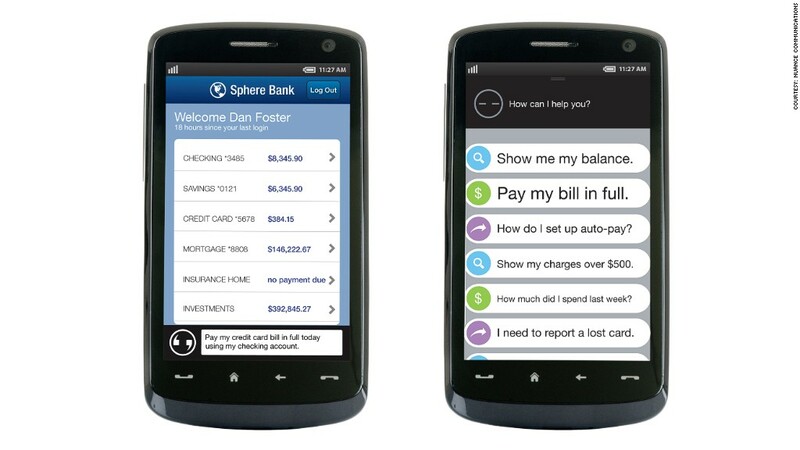 USAA has announced that it will integrate Nina into its app. Nuance says it expects other financial institutions to come on board soon. Apple (AAPL) may have chained up Siri, but the technology's creators working to let her features loose on other platforms.